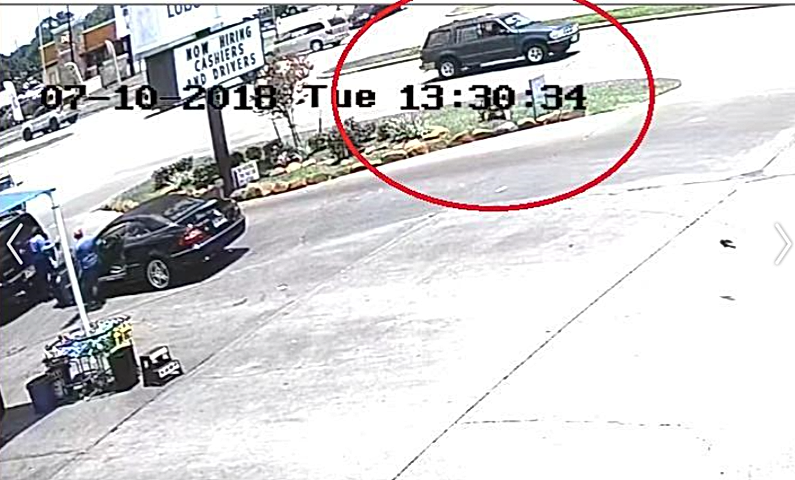 Harris County Sheriff’s Office investigators are releasing still photos of a vehicle involved in an aggravated assault on a 39-year-old female that was shot on S. Mason Rd. on Tuesday afternoon. The victim was shot by an unknown suspect around 1:30 pm while driving southbound on South Mason Road. On Tuesday, July 10, 2018, deputies were dispatched to an in-progress call at Simoniz Car Wash at 910 S. Mason Rd. A female complainant advised she was shot in her arm while driving on Mason Rd. Deputies observed a bullet hole to the driver’s side window of her 4-door SUV. She was transported to the hospital with non-life threatening injuries where she underwent surgery. Witnesses, employees and customers, at the car-wash business stated they heard a single gunshot and observed the complainant driving into the carwash. The female stated a Ford Explorer SUV driving next to her when she was shot. The victim told investigators she was not involved in a road-rage incident prior to the shooting. The victim was transported by EMS to the Memorial Hermann Southwest Hospital in good condition. Anyone with information on the vehicle is urged to call the Harris County Sheriff’s Office at 713-274-9210. Katy Magazine first reported this story on Tuesday afternoon. Click here to read the original story.